[miau] The comic book character Judge Dredd is judge, jury and executioner, and he has been featured in action movies in two different decades. Now, he has come to lay down the law in the world of slot machines. In 2014, NextGen Gaming released Judge Dredd’s slot machine. The company built a lot of fun action into the game. How Many Reels and Pay Lines Does Judge Dredd Offer? This exciting machine offers players five reels and 24 pay lines. Players can maximize their opportunities to win prizes by taking advantage of Judge Dredd’s “Super Bet” feature. This side-bet option adds excitement to the game by placing wild spots onto all five of Judge Dredd’s reels. Unlike many slot machines, all of Judge Dredd’s pay lines are always in play. With 24 pay lines, the player enjoys thousands of winning combinations on this slot machine. What Spot Values Are on Judge Dredd’s Reels? The list above represents all regular available values. Does This Slot Machine Offer Wild Spots? 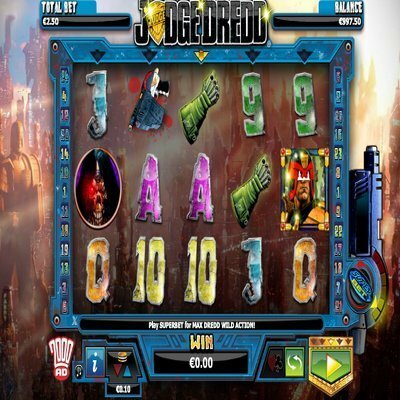 The Judge Dredd Slot machine offers a wild spot that appears as the image of Judge Dredd and is accompanied by the sound of his weapon firing. Sometimes, Judge Dredd’s wild card goes into “I Am the Law” mode and blasts a spot of another value off a reel. This helps players win prizes on results that would otherwise lose. Top prize on the Judge Dredd slot machine is 2,500 credits. If a spin of the reels results in five “Scatter” badges in a row, the player wins the top prize, and the machine makes a big, noisy deal about it! Judge Dredd stands apart from many slot machines because its “I Am the Law” feature makes wild cards appear out of seemingly nowhere. This machine spins quickly and its action-movie soundtrack keeps the game-play exciting. In short, Judge Dredd is a blast to play! Find Judge Dredd and play it, but remember that he is judge, jury and executioner.